Home » Special Package » Black Friday Special! 30’s Day campaign has now OFFICIALLY STARTED, and you are invited to join this campaign! Please note: This offer is open to only those customers whose $100 donation are confirmed received to Zara Charity online payment (donation link) to support Ngorongoro Maasai Pre-school Solar Project. Offer available until 23:59 on September 30th. If you are not fortunate enough to win the Grand Prize, don’t worry. Our sales consultants will be happy to offer you a discounted rate of USD $170, on any tour of your choice (Which run with a minimum of 6 days). Every month on the 30th, it is 30’s Day! On every 30th, 1participant win a Tour at an EXTREMELY LOW price. Every $100 donation to Zara charity puts your name in the drawing for the safari and earns you a discounted rate in this special campaign, the winner will be chosen by a draw. To enter to win, make a $100 donation to the Zara charity Solar project and Win 8 days Safari, offer available only from the 27th August 00:00 until 30th September 23:59 EAT. 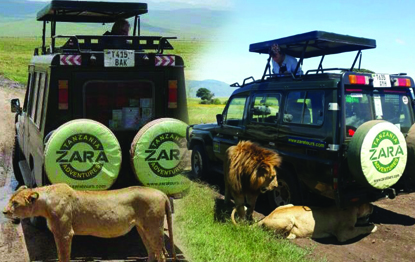 WIN Best of Tanzania 8days Safari package for ONLY US$ 100 ! !